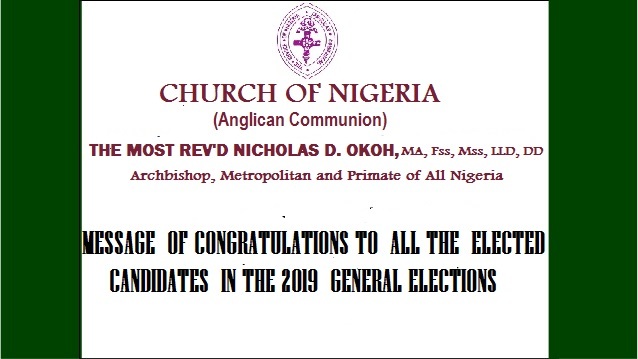 The Church of Nigeria (Anglican Communion) wishes to congratulate all those who have been declared winners of the various elective positions in the just concluded General Elections in Nigeria. We wish to assure you of our fervent prayer for grace to keep the trust reposed in you by your elections. We request that you ensure that the next four years will witness peace, stability, cohesion, unity, justice, equity, fairness and freedom for all the citizens of this country. May prosperity, oneness, security of lives and property, brotherly love and affection as well as true sense of patrioti.sm be the hallmark of your tenure .